Please tell our readers about your work and background. I am a paper illustrator specialising in creating three-dimensional lettering to make creative designs. I have studied applied art with a major in typography in my formative years. Since 2005, I have been dabbling with paper but it was only in 2011 that a decision was made to pursue it professionally. My artworks are used by brands for promotional campaigns, posters, book covers and editorial illustrations. What exactly is paper quilling/illustration or typography? Paper is a crucial element of my work. Strips of the material are rolled, shaped and moulded in a certain way and glued to a base to make a particular design; this process is known as “quilling”. I don’t make digital-based illustrations; everything is done manually without the use of any software or technical equipment. “Typography” involves quilling, layering, sculpturing to make intricate compositions. It’s an art of forming and arranging paper fonts to make them readable and appealing. How did you discover quilling and make a profession out of the art form? I always had a very keen interest in beautiful writing and calligraphy. I completed my degree in graphic design with a focus on typography and concentrated purely on paper art and 3D-paper sculpturing. I have never had any formal training in paper art. It all began as an experimental project that involved quilling an entire series of A-Z alphabets and at that time, I didn't even know it was called quilling. Honestly, there was never any intention to pursue quilling as a career until I started getting offers from clients wanting to use my work for their marketing campaigns. Can you run us through your design process? What kind of equipment and techniques do you use? Every process for me starts with an idea or a concept that manifests in pencil-sketched drawings. I collect various kinds of paper sourced from different manufacturers with varying colours and weights. To begin designing, I cut paper into strips or shapes with box cutters and a quilling needle and cocktail stick help me shape the structure and paste it on to a base. On completion, the illustration is photographed using studio lighting to get the perfect shot. Since my artwork is three-dimensional or 3D-based, it is the photograph which is eventually showcased. You have a distinct style of typographic expression. How did you develop it? I always try to communicate beyond what is visual. Over the years, my typographic style and design sense have evolved to think that less is always more. I add fascinating visual elements which evoke a sense of joy and happiness. I combine a lot of textures and styles to add effects and depth to every piece. I begin creating a particular letter or word based on the significance. It could be a form or an object, or something abstract with texture and vibrant colours. How long does it take you to go from sketch to a completed design? Does a project ever surprise you along the way? Every project takes its own time; sometimes it can take three days or even three months, depending on the size and intricacy. When it’s a client-based project, there are many modifications which make the process a little longer. Every project comes with its surprises and I get to learn a lot along the way. Quilling makes me discover new things about my abilities to give better results while I get to understand the importance of paper more. What are some of the most noteworthy campaigns you have worked on? I got my first professional break from Tanishq. I worked with the MullenLowe Lintas Group, an advertising marketing communications firm, to create a series of paper letters inspired by their jewellery pieces which were used in Tanishq’s billboards across the country. It was a surreal feeling when my work was being recognised and appreciated. In 2015, Instagram commissioned me to create two pieces to celebrate a milestone they had achieved with their users. Those original artworks now hang in their headquarters in San Francisco. In 2017, I was one of the five artists Instagram chose to create an artwork which depicted what ‘love’ means. For Karnataka tourism, the (replica of the) majestic Mysore palace that I created was put out at airports as well as in international inflight magazines. Two years ago, creating the Google Doodle for Independence Day was the biggest highlight of my career. Later in 2018, I produced artwork for the 25th anniversary of Adobe Acrobat. What challenges did you face while designing for Google’s celebration of India’s Independence Day doodle in 2015? How long did it take to create that outcome? Considering that it was a paper artwork to be represented on a digital platform, the most challenging part was to maintain the proper size for the logo and the right after-effect of the photoshoot. The ideation, sketching and designing the paper-based Google Doodle took about two months. As for my conceptualisation, it was inspired by rangolis that I infused in the Ashoka Chakra. I wanted to create something unique that has two contrasting elements; the robust Parliament structures with straight lines for pillars and curly colourful peacocks. 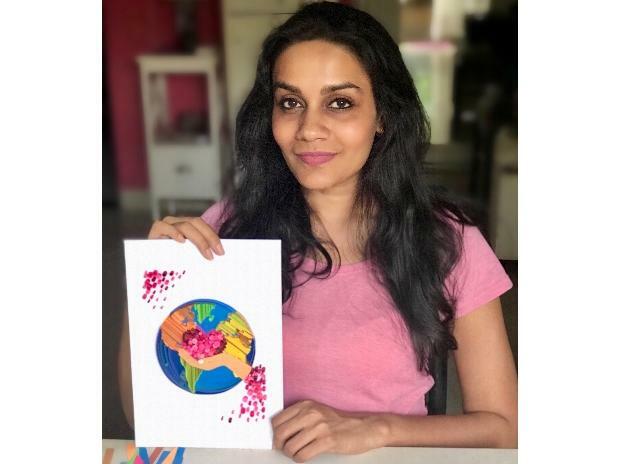 What were your feelings when Google CEO Sundar Pichai shared your Google Doodle artwork on his Instagram page? I was exhilarated to learn that Google's CEO appreciated my work. I am so humbled and happy that it was liked by so many people. Did you begin quilling for commercial reasons or was there a transition? During my formative years, I wanted to be a paper artist. Initially, I was working as a freelance graphic designer using digital software. But somehow I wasn’t enjoying that process. I always loved crafting things with my hands and so thought of making letters with paper. I pursued quilling as a hobby initially and never expected it to garner so much interest. So it has always been a very organic process. Even today, I try out new methods in order not to be repetitive in my approach to the subject. What kind of obstacles does a paper illustrator usually face? I think every job comes with its share of obstacles. Working independently was quite hard in the beginning. A paper artist usually juggles with more than one project at a time. There have been times when I had turned a client down as I was occupied with other pending projects. My work is handcrafted and it takes time to finish so some of my clients used to be impatient and expected me to execute their projects in haste. What advice do you have for quilling beginners? The first advice I would give is, don’t copy designs, create your own original style and explore your creative skills to set yourself apart. Find inspiration in observing art of different kinds, such as dance, music, theater, photography, nature and much more.